This entry was posted in family, food, random thoughts, shopping, travel and tagged Butter, Cookie Butter, desserts, food, Graham cracker, grocery stores, Nutrition facts label, Peanut butter, shopping, Speculoos, Sugar, trader joes by Coffee with Cathy. Bookmark the permalink. Trader Joe’s peanut butter has been recalled as has a lot of other peanut butter containing candy, cookies, ice cream due to a Salmonella contamination at a factory in Mexico that supplies a component of peanut butter. That stuff is insanely yummy. Mary — You are so correct. 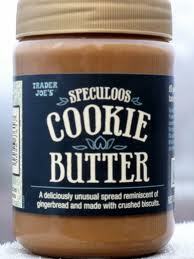 Luckily, nothing healthy — such as peanuts — has anything to do with Cookie Butter. Just cookies and sugar, sugar, sugar.